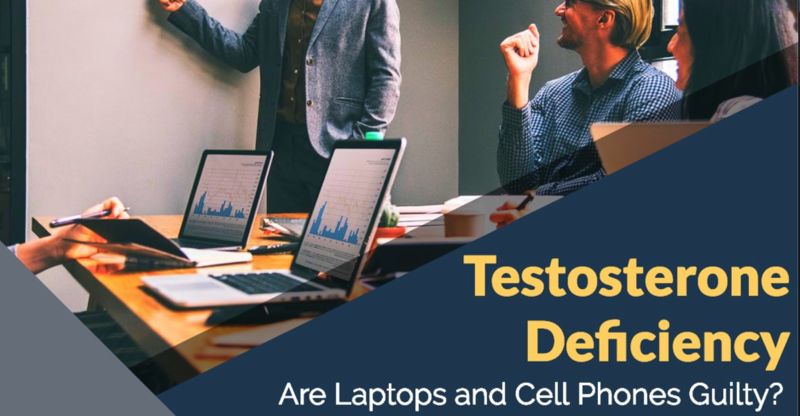 Testosterone Deficiency – Are Laptops and Cell Phones Guilty? Testosterone slippage is what is waiting for each man when he is getting older. The process of such a hormonal decline is unavoidable and sooner or later it becomes impossible to brush aside disdainfully the problem. Then the men who don’t wish to pander to negative effects of testosterone deficiency try different ambiguous methods which as the men think have to get things back on the rails. But actually what except the aging can ruin your hormonal balance? Well, now everybody knows that pernicious habits and unhealthy lifestyle are the most frequent reasons for the lack of testosterone. However, they are not only threats which lie in wait of trap for the man’s hormonal balance. There is an opinion that some invisible testosterone enemies exist. And they include laptops and cell phones. Let’s find out whether this is true. Since the time when laptops started to speed like wildfire, more than 10 years have already passed. This period was also marked by the catastrophic downfall of testosterone levels in men. That’s why the experts supposed that there is an interrelation between these two appearances. This supposition is not groundless. The matter is that laptop put on the knees warms up testes. And testes are actually the place where testosterone occurs in a natural way. Warming up first of all cracks down on sperm production. But it seriously disrupts the ability of testes to synthesize not only sperm but also testosterone. The research has also thrown light on the other danger with which the use of laptops is fraught. Thus, the application of laptops is accompanied with the emission of electromagnetic frequency (EMF) radiation. The measurement of this radiation has indicated that laptops emit 200 milligauss. This amount exceeds the normal, noncancerous readings by 600 times. EMF is very harmful for testosterone synthesis in men. So, the uncontrolled use of laptops negatively affects the men’s ability to supply themselves with adequate amount of testosterone. Nowadays, almost 100% of men have at least one cell phone. And many men have more than one cell phone. The bad news is that when using cell phones, the men expose themselves to unsafe EMF. According to the estimates, cell phones can radiate up to 50 milligauss. This is approximately 167 times more than EMF levels which can’t harm the human health. Though this level is not as high as laptop emission, it’s necessary to remember that the man spends with his cell phone no less than half a day and even longer. The problem of negative cell phone influence on the men’s overall health in general and hormonal balance in particular substantially aggravates with the fact that the majority of men hold their cell phones in the pockets close to their testes. That’s why EMF inflicts damage on testosterone secretion. Since in the modern life we can’t completely refuse from the blessings of civilization such as laptops and cell phones, it’s worth learning to use them safely. To decrease the negative impact of laptop on your testosterone levels, place a small pillow on your knees before putting your laptop there. But the best solution is to use portable laptop tables and stands for couches and beds. To minimize radiation emitted by your cell phone, don’t store it in your genital area. It’s much better to place it into your brief case or a jacket pocket. If you follow these tips instead of turning a blind eye to the issue, you will fight the lack of testosterone.